Photos show The Oaks and Bay Trees apartments. The Oaks is shown first. These stunning apartments are within a newly converted and refurbished Country House. Each apartment provides quality spacious open plan living, dining and kitchen areas and have light and airy bedrooms. The apartments all have 2 bath or shower rooms with modern fittings and the fully fitted kitchens include a dishwasher and washing machine and have solid wooden worktops. This lovely Georgian building is full of character and charm whilst providing all modern conveniences - there is free wi fi in all the apartments, of course, and a small welcome pack will be provided. The huge sash windows facing south overlook the garden where you can watch the birds feeding at the table as well as the naughty squirrels who usually take the nuts first in the mornings. The grounds have a pathway and private gate into the nature reserve and woodland beyond and we have a nature "hut/hide" where you can sit and watch for birds, bats, badgers and other wildlife There is a picnic, barbeque and campfire area with plenty of rustic seating within the grounds, for you to use or just sit and relax. We do ask that smokers only smoke outside the property and we happily accept children over 5 years old - please supervise children at all times especially when playing in the gardens. The owners are a semi retired couple who live in Pembrokeshire and enjoy many winter months in Carvoeiro. We have many friends in Pembroke, especially since running a small restaurant before retirement. Maurice was born and bred here in what is a small and friendly community. Christine also ran a villa rental company specialising in Carvoeiro for fifteen years and many of her owners and contacts in Carvoeiro have become good friends too. So, of course, we feel equally at home in either location. We both love walking the coast paths, eating out and exploring generally. We love "outdoor living" when possible and our two homes give us plenty of that. We are so, so lucky to be able to share our time in these lovely surroundings. This building used to be an hotel, had closed down and I just fell for the grounds with the trees surrounding the grass with so many wild flowers, birds and butterflies. It's great that it adjoins the Pembroke nature reserve and we have our own access gate leading into the woods. 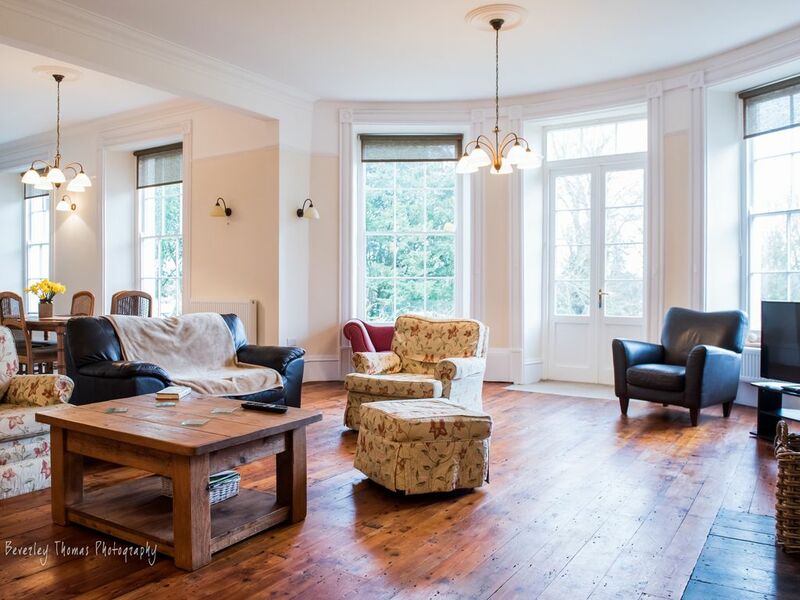 The building is special - its Grade 2 listed and I wanted to restore as much as possible and convert into high spec apartments with tenants and visitors to enjoy the grounds and natural wildflowers and wildlife around. Everyone locally knows Holyland (pronounced Hollyland in these parts) and many have memories of christenings, weddings and functions being held here in the days of Holyland Country House Hotel as it was then known. Now there is a new life here but the wonderful atmosphere continues. You will enjoy the spacious rooms in this south facing ground floor apartment - it is wonderful for family parties and the ceiling will take a huge, huge Christmas tree too. Think about this if you have family nearby. We hope you will enjoy these individual apartments - they are all different and each has a charm of its own. Wood is provided if you like a fire in the evening. The living area is huge. Access to the grounds, of course. Water sports can be arranged at the shop next to McCalls which is less than 1km from the property. There is a golf course at Pembroke Dock approximately 3 miles, and two courses at Tenby which is around 10 miles. There is also a driving range at Heatherington which is around 6 miles (Opposite the Manor House Wildlife park). Excellent position for exploring the area, well equipped apartment with benefit of french doors leading onto terrace & gardens and very helpful owners. 2 minor grumbles, bathroom blinds & bigger bath towels please! Thank you for your review and nice comments. We take on board minor moans, of course. Thank you, it was great to meet you and we hope you will come again. the apartment was beautiful and light with everything you could need. the weather could have been better as we didn't get to eat in the lovely garden but it didn't stop us from getting out and about. Perfect place for a family break in Pembroke. Very spacious two bedroom apartment; thoughtfully decorated, airy and light, with access to large garden. Very friendly owners. We definitely plan to be back. Thank you so much. We like to know our guests enjoy their stay and we hope to see you again soon. The property was well placed for visiting the many attractions. It was a lovely holiday home and the owners very friendly. The area around was very scenic and there was an easy walk from the garden and through the wood to Pembroke and the castle. The apartment itself was spacious, well stocked with all the necessary equipment in the kitchen and with large windows and French doors made it lovely and light. It had a large patio area with table and chairs that was ideal after our days out. Ideal base for a lovely holiday with plenty of places to visit and beautiful scenery. Would definitely recommend. Excellent accommodation in a perfect location for exploring Pembrokeshire. A comfortable apartment with plenty of space for four people and a fine terrace for sitting outside in good weather. A fifteen minute walk to the heart of Pembroke with it's many restaurants and pubs. Great for walkers, nature lovers, surfers and bird watchers. The nearest beach at Freshwater East is around 5 miles and the popular seaside town of Tenby is around 10 miles. Other beaches within reach are the quiet beaches of Barafundel, Swanlake Bay are also within easy reach, as is the well know long wilder beach of Freshwater West known for its rolling coasters and laverbread hut. Pembroke town has a tidal millpond with many ducks, herons and swans and even otters are spotted here. Pembroke town centre is under a mile, the county town of Haverfordwest around 8 miles. Numerous beaches (and coastal towns and villages) all within a 5-10 mile radius, including the well know Tenby with its pretty harbour and huge south beach. Pembroke has plenty of coffee shops, restaurants, takeaways (3 fish & chips shops) and bars. There are several banks including Barclays, Natwest and Lloyds, a good supermarket, greengrocer and butcher and all the usual arts and crafts. There is a WI market held in the town hall on a Thursday. Stop off at the information centre on the Commons (big car park) and find out about all local activities and places to visit. Booking Notes: Phone or email to reserve, then follow with 25% deposit, balance 8 weeks prior to start date. Less than 8 weeks, please pay in full at time of booking Changeover Day: Normally Saturday, but other dates in low season. Please contact owner Notes on prices: Discount for couples in peak season.